Malaysia Bag Supplier – Buy Non woven bag, recycle bag, Laptop Backpacks, document bag and travel bag at wholesale price! READY STOCK PROMOTIONAL BAGS WITH WHOLESALE PRICE ! 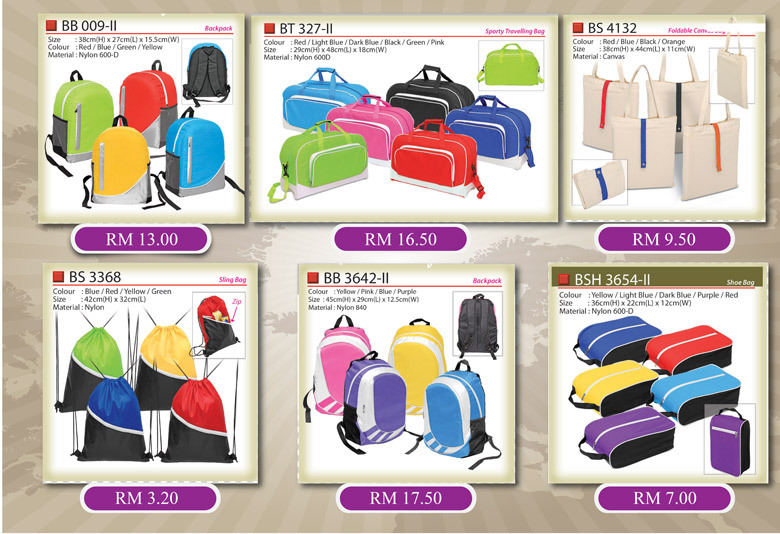 Welcome to MalaysiaBag.Com, your trusted and preferred promotional bags supplier and wholesaler in Malaysia. We are one stop custom printed bag supplier that able to supply ready stock bags with branding logos and name as required. Here you will find wide variety of promotional logo bags including non woven bag or recycle green bag, laptop backpack, conference bag, seminar holder, travel bags, cooler bags, document bag, sling bag, sports bag, shoe bags, toiletries bag, waist pouch and trolley bags. Please visit our main website of www.yvmarketing.com.my for more updated design with complete range of products. As we strive to become the number one of supplying promotional bags in Malaysia, we always adding new innovative bags design in our product range and we always ensure that the selling price is at most competitive level. We are able to customize the bag with three branding options namely the silk screen printing, heat transfer and embroidery stitching. You may refer the type of branding services here. Promotional bags with personalized logo indeed a good promotional items to be given out as corporate gifts. It has high retention value with maximum branding exposure. If you are looking promotional bags for your marketing events, please feel free to browse through our extensive online catalogue or you may contact us at 03-80703828. Our friendly consultant will serve you professionally. You may download soft copy of our bag catalogue here. It is that time of the year again for another event. Maybe you’re having a company open day, organizing a conference, holding an exhibition or simply introducing a new product. Regardless, what is an event without guests? And these guests can’t just return empty handed, what will people say? For this matter, you need a promotional door gift, but what to choose? One gift which tops the list, is a recycled paper bag. Have you ever walked around and came across a bag that made you think, “Oh my, that bag looks nice!” We’re not talking about designer bags here. We’re talking about paper bags. Good old’ paper bags, but not just any paper bags. While the materials for these bags ranged from cardboards to laminated papers to recycled papers, all of them share the same characteristic, and that is the patterns drawn on their surfaces. Some may have floral patterns, fauna patterns, some may even have cartoon patterns. Regardless of each person’s varying aesthetic values, none would deny that these paper bags catch the eyes of the onlookers. Most of these paper bags often have simply patterns or drawings on them, printed upon a monochrome background. And this makes them a lot more eye-catching than even the most expensive single coloured designer bags made of gold and leather. These paper bags are also quite durable. Most often, they can be used for hundreds of times without any significant signs of damage. It can’t carry too much load, mind you, but then again, what bags can carry more than it’s designed for? It’s durable enough to carry a hundred times its own weight, which is good for its price. Speaking of price, perhaps there is no need to be said that these paper bags are very affordable. A company can purchase a thousand of these and it wouldn’t even make a noticeable increase in its expenses. 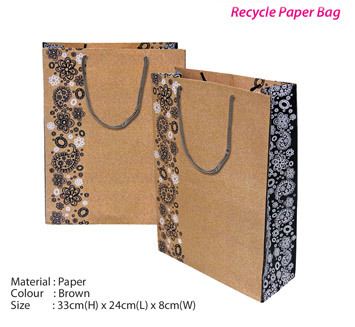 For mass events, where a catchy but a lot of affordable door gifts are needed, recycled paper bags are great and perhaps more suitable than specially designed event pens. For mass events, a functional door gift is much more suitable than one designed for elegance. It can function as an eye-catcher. It can function as a bag, for your guests to carry brochures, samples, free gifts or simply their own purses. Since the paper bags can carry items many times their own weight, one can use it to carry books, groceries or as a general carryall. A recycled paper bag can carry anything that can fit inside it and this can serve as free long-term advertisement for your events, even long after your events have passed, in case you’re planning on holding it again in the future. Many things can be said about recycled paper bags, but no one can deny that it’s a very good door gift where propriety is more important than elegance. It is catchy, it looks nice, it’s durable, it’s cheap and it’s functional. Why would anyone not want to use recycled paper bags for a promotional door gift? In today’s modern era, almost everyone owns high tech devices like cell phones, tablets, laptop, and many more. All of these devices are portable and handy so people can use it anytime and anywhere and since you need to carry it anywhere you go, it is absolutely more convenient if you have cases and bags to carry it, especially for laptops. Since laptops are usually heavy and perhaps the biggest among other devices. It is essential to have a bag to easily carry it wherever you go. Laptop bags are sure to make the carrying, more convenient and comfortable. 1. Perfect fit – You should know the exact size of your laptop to ensure perfect fitting, it is very significant that your laptop fits perfectly inside the laptop backpack to avoid shaking inside the bag because of a loose space, which might cause damage to your laptop. 2. Extra pockets – Make sure to choose a laptop backpack that has several extra pockets so you can put your laptop’s accessory like mouse, adapter, and any other device that you need to carry together with your laptop. 3. Ultimate comfort – You need to ensure that the laptop backpack efficiently serves its purpose, to give you ultimate comfort even you are carrying a heavy laptop. You need to check the fabric used and make sure it has foam in the strap, in order for you to carry it conveniently and comfortably. 4. Waterproof – It is highly advisable that you choose a waterproof laptop backpack to avoid any kind of liquid damage in it. Water surely causes damage to laptop or any kind of device. 5. Insurance – Make sure that the laptop backpack that you are going to buy has additional safety features to add protection for your laptop. There are special features that can protect your laptop from hard impacts. 6. Style – Laptop backpack comes in numerous designs and styles make sure to choose the one that you love and the one that looks good. In order for you to achieve both effectual and fashion. • Personalized – You can choose your own design from color, size, and many more. You can even put the name of the receiver or the favorite design in order for it to be more personalized. • Effective marketing – Since you can choose your own design, you can definitely put you business’s logo to effectively promote it. This is definitely one way of promoting a particular business because these bags are very useful. Receivers are sure to use it more often so lots of people would definitely see it. • Larger target market – One of the purposes of laptop bags is for easier carriage and people usually use laptop bags whenever they travel. Since they are traveling, laptop bags can reach different places and so is your promotion. What is non woven bag? Non woven bags may look like a normal fabric bag, but they are actually made by binding chemical as well as using solvents, heat, and mechanical treatment. This type of bag is an excellent choice for holding promotional gifts that are given at conferences or seminars. For example, a non woven bag may be used for books or any other item that is given away as a gift. Sturdy and strong, they are excellent for carrying various items. Non woven bags are also great as gifts for students, every day folk, or professionals, being used as a promotional item; they are cheap to produce as well as being environmentally friendly. This type of bag is great for the eco conscious individual due to the materials that are used in its fabrication. Wherever you turn your head you will spot people with promotional bags that are marketing a logo or brand. When you see the bold logo or name on the bag it will stick in your mind, making it an excellent marketing tool for your own brand. Such bags represent you as a company that is using an innovative marketing method that is also kind to the environment; a company that cares about the environment is very important in modern day society. Non woven bags have grown in popularity and are now a firm favorite for companies all over the world who are searching for a great way to promote their brand. You will find hundreds of different non woven bag suppliers that will offer you non woven bags, so it can be difficult to choose which one to use. One point that you should remember is that you should always buy your bags directly from the manufacturer. When you seek bags directly from the manufacturer, you will be assured the very best price as well as the best customer care and quality. When you invest money in non woven bags, you are making a sound investment that will bring you a return for your money. With your brand or logo firmly stamped on these bags, the bags themselves will market your product or company for you, these bags being seen by everyone as they walk down the street. When purchasing non woven bags for your company, there are a few decisions that you will need to make, the first being the size of the bag. The size you choose will depend on the type of company or business that you have. For example, promotional bags for supermarkets will generally be large; a clothes store or a gaming shop will use smaller bags or a variety of different sizes. Once you are firmly decided on the size of the bag, the next step is to choose between a gusset and flat style bag. A flat bag is the best option for soft items such as clothes; a gusset bag with an extra piece running along the bottom is great for larger items. There is no rule to stick to here; you need to think what you need most and what price you wish to pay for your bags. You need to think about who your customers are in order to target your audience successfully. When you think about who your customers are, you can then start to decide about the logo you will use on your bags. There are a wide selection of colors to choose from too, allowing you to match your bags with the colors of your company logo. However, if you have a bright logo, do not make the mistake of ordering bags in that color; instead order a white or black bag that will allow your logo to stand out. The bigger the logo, the better; a bold logo will stand out and will get people to notice you. You can even use the whole of one side of your bag for printing your logo; the bigger the better. There are several ways to print your logo on your bags; silk screen printing is the best option for a logo that will last a long time without rubbing off, silk screening also is the most affordable option. Buying in bulk is the best option. When you choose to buy in bulk you can cut down on the overall cost of your no woven bags as you will be able to take advantage of discounted rates. When you are giving away your bags as promotional gifts, you need a quality item at an affordable price. When printing the logo on your bags, once again you will be able to save money when you order a high volume of bags; so think bulk and you will save lots of money. Once you have firmly in your mind how you want your bags, you need to take into consideration the shipping time. Order well in advance to ensure that your bags arrive before your conference or seminar; this will allow you to hand out your bags on time when your customers visit you.